Reduce stress – some people find that their acne breakouts increase during stressful periods of time. Keeping stress levels under control can reduce the incidence of breakouts. 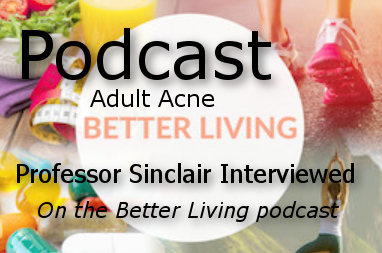 Professor Rodney Sinclair notes that if you are an adult experiencing acne, there are 4 proven ways to say goodbye to it. If you have mild adult acne, there are many over the counter medications available at your local pharmacy. The most effective and fast treatments contain benzoyl peroxide. Your pharmacist will be able to advise the most suitable ones for your skin condition. If you have been used over the counter medications for your adult acne and they are not working, it’s time to see your General Practitioner for adult acne prescription medications. While 9 out of 10 adults who have adult acne treatment with Isotretinoin will be cured from, in some cases the medication does not work. While Isotretinoin is effective, it is important to note that not everyone can take this drug due to side effects that include mood changes. Sinclair Dermatology is currently running a clinical trial for moderate to severe acne with another Acne trial due to commence soon.